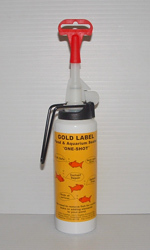 Same as original Gold Label sealer but now in handy 'ONE SHOT' container. No need for a cartridge gun, just twist nozzle and squeeze the trigger!! Once opened use within 3 days. Also available in original 290ml and 100ml size and repair tape.